A Canadian entrepreneur who now has vineyards in California including areas in the famous Stag’s Leap district. This crisp white wine will go up against any of the New Zealand sauvignons with a nose of green apple, starfruit and citrus fruits. Flavors of tart apple, grapefruit and earth. A good finish. A good Californian Sauvignon Blanc. 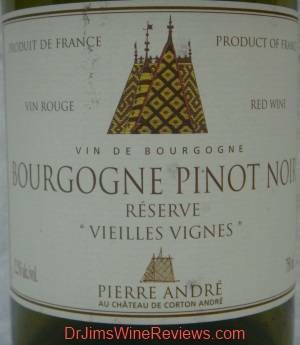 Red Wine: Bourgogne Pinot Noir, France. Translucent red with a good aroma of truffles,toast and limestone. Taste of mild fruit, plum and truffle with a nice tar finish. A good starter Pinot Noir.